For the film based on the book, see Mystic River (film). The novel revolves around three boys who grow up as friends in Boston — Dave Boyle, Sean Devine, and Jimmy Marcus. When the story opens, we see Dave abducted by child molesters while he, Sean, and Jimmy are horsing around on a neighborhood street. Dave escapes and returns home days later, emotionally shattered by his experience. The book then moves forward 25 years: Sean has become a homicide detective, Jimmy is an ex-convict who currently owns a convenience store, and Dave is a shell of a man. Jimmy's daughter disappears and is found brutally murdered in a city park, and that same night, Dave comes home to his wife, covered in blood. Sean is assigned to investigate the murder, and the three childhood friends are caught up in each other's lives again. Mystic River, the Academy Award-winning adaptation of the novel, was released in 2003. The film was directed by Clint Eastwood and starred Sean Penn as Jimmy Markum (the character's last name was changed from Marcus to Markum for the film), Tim Robbins as Dave, and Kevin Bacon as Sean. Sean Penn won the Best Actor in a Leading Role and Tim Robbins won the Best Supporting Actor for their respective performances. It was also nominated for four other Academy Awards: Best Picture, Best Director (Eastwood), Best Supporting Actress (Marcia Gay Harden), and Best Adapted Screenplay (Brian Helgeland). 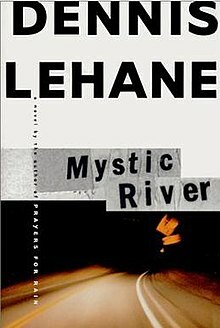 Mystic River won the 2002 Dilys Award presented by the Independent Mystery Booksellers Association. The same year, it also won the Massachusetts Book Award. ^ "Book awards Honor Kunitz and Massachusetts authors". Massachusetts Board of Library Commissioners. Retrieved September 2, 2015. "Nobody Puts Brady in a Crestmore"
This page was last edited on 11 December 2017, at 10:46 (UTC).